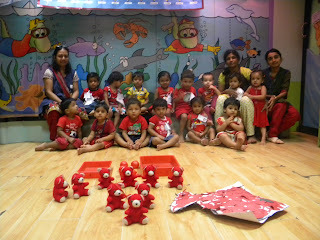 Our playgroup section celebrated Red Day and the entire class was decorated with red colour objects. All the teachers and children came in red colur dresses. Children brought fruits which are red in colour like apples,strawberry,cherries and they also brought bread and red miexed fruit jam in their tiffin. 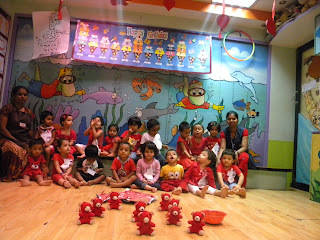 A story on Red colour was told to the children which they listened to attentively and enjoyed.